Come Together: Surviving Sandy, Year 1 was never meant to be only an exhibition of visual art. 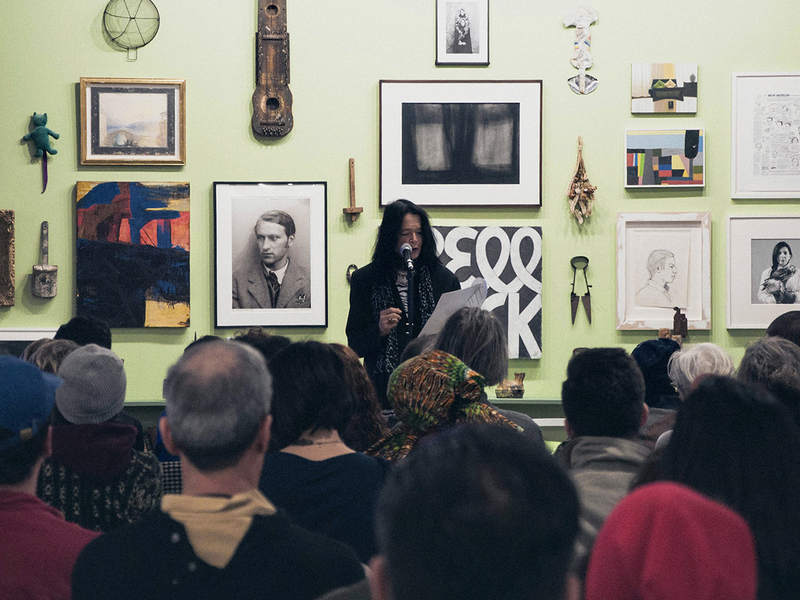 From the first days of planning, everyone involved at both the Dedalus Foundation and the Brooklyn Rail wanted the galleries to serve as a forum for an expansive dialogue between the works on display and a variety of performances, literary readings, film screenings, and panel discussions. 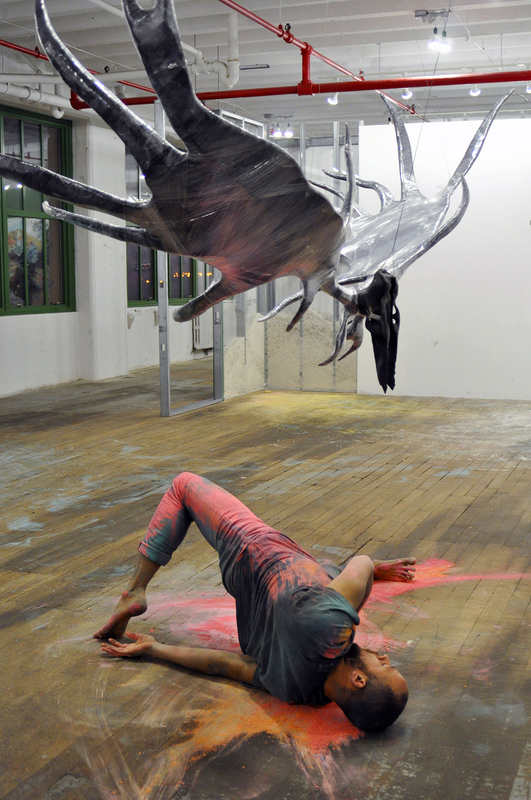 All of the organizers were deeply involved with all of the arts: this kind of broad engagement is one of the hallmarks of Phong Bui’s work, and for Dedalus it was an engagement that went all the way back to its founder, Robert Motherwell, who was deeply involved with poetry, music, and dance, as well as with the visual arts. So our decision to have the exhibition accompanied by varied programs of dance, music, and poetry reflected not only our personal interests but also a continuity of well-established traditions at both Dedalus and the Rail. A number of questions became immediately apparent. How might a large and diverse community come together after tragedy, and what form might its expression of recovery take? 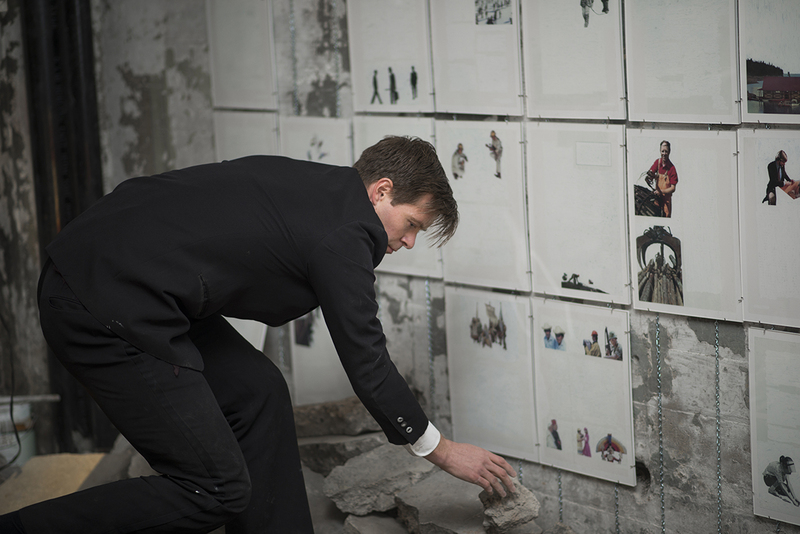 How could we, the organizers of the exhibition, provide a creative support network for those who were affected? Expanding outward from the core idea of solidarity within both the art community and the greater community of New York City, Come Together became a stage for both artistic experimentation and exploration of how everyone affected by the experience of the storm might continue to grow stronger from this tragedy. All of the events mounted during the exhibition were held in the galleries, surrounded by sculptures, paintings, installations, and videos. 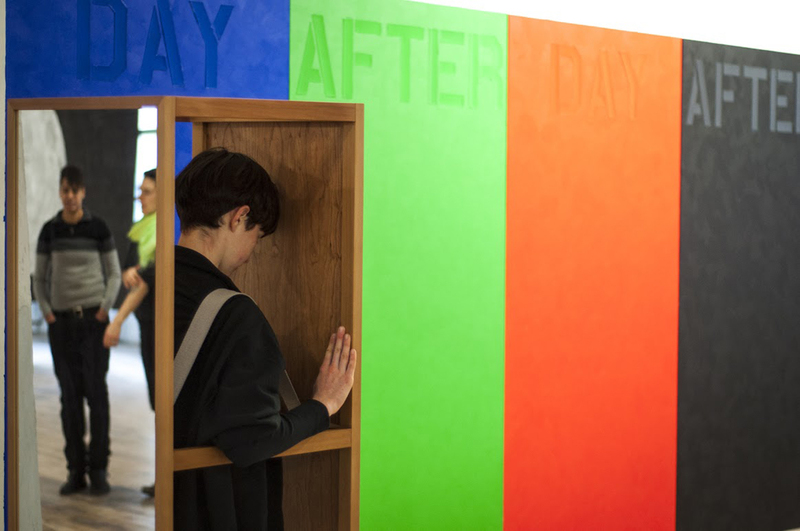 This lent a new dimension to the physical exhibition by activating the works and the spaces between works in new ways. The events were not only interesting in themselves but also gave rise to new interpretations and inspirations. 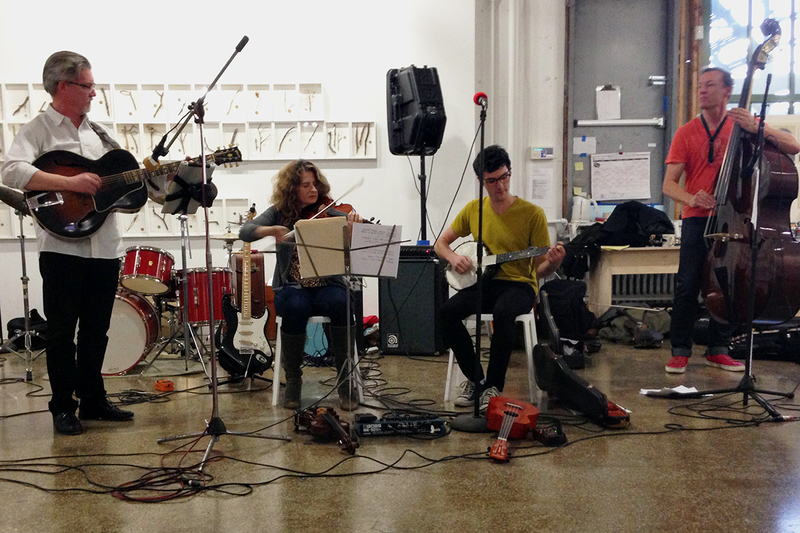 This began as soon as the opening night, with performances of Josiah McElheny’s Walking Mirrors and Matthew Lange’s Archeology of the Plummet Machine Vol. 1 —very different kinds of interventions, both of which simultaneously reaffirmed the physical presence of the exhibition spaces and called into question their stability. Artists in all mediums connected strongly to the environment, creating works that, like the spaces, were at once intimate and vast, and which gave rise to very particular kinds of performances. The large, high-ceilinged industrial spaces of Industry City gave viewers a relationship to the work that was different from what might be experienced in the polished white cube of more traditional galleries and museums. The exhibition was infused with a sense of freedom and accessibility, which was enhanced by the unfinished floors and peeling concrete ceilings. Artists in all mediums connected strongly to the environment, creating works that, like the spaces, were at once intimate and vast, and which gave rise to very particular kinds of performances. 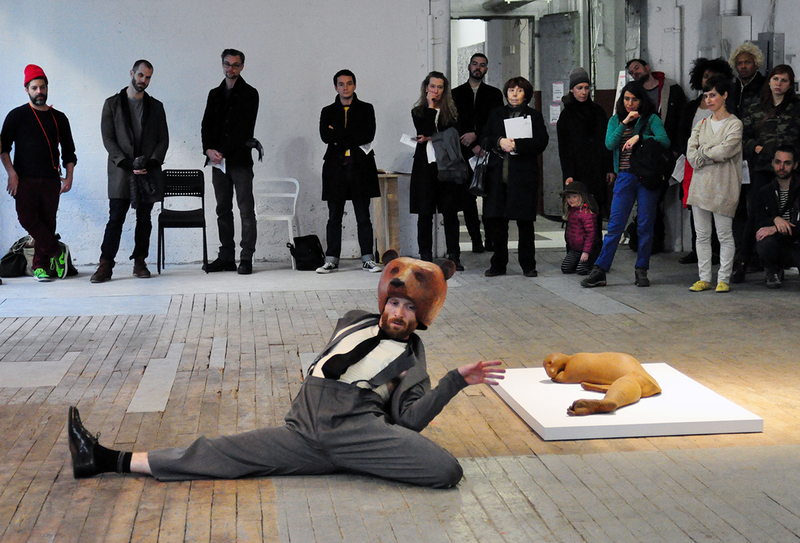 “The Animal Suite: Experiments in Vaudeville and Shapeshifting” choreographed by Cori Olinghouse, performed by Neal Beasley, in “Perfoming the Precarious: Day into Night,” presented by Danspace Projects. December 7, 2013. Photo by Ted Roeder. One of the most striking instances of this was Danspace Project’s presentation, Performing the Precarious, a two-part intervention into the galleries. The second part of this program was a series of dance events performed over several hours, in the changing light of a winter afternoon, on December 7. Conceived as “poems in space” by curator Judy Hussie-Taylor, this event included a number of different performances that were staged at the same time in different parts of the exhibition, and which were repeated in such a way that viewers could see most of them one after another and then go back and see repeat performances (several repeated three times during the course of that single day). Some were new works, created in specific response to the themes of the works in Come Together. Others were reinterpretations of earlier works, reconfigured in response to the new context. Rebecca Davis’s excerpts from will however happen, and Cori Olinghouse’s The Animal Suite: Experiments in Vaudeville and Shapeshifting, were excellent examples of works that had been created earlier and had been revised, and even transformed, for the new context in which they would be seen. “White,” choreographed by Michele Boule in “Perfoming the Precarious: Day into Night,” presented by Danspace Projects. December 7, 2013. Photo by Ted Roeder. “decumulation,” by Will Rawls in “Perfoming the Precarious: Day into Night,” presented by Danspace Projects. December 7, 2013. Photo by Taylor Dafoe. Will Rawls’s solo performance decumulation, which was staged around and underneath Michael Joo’s sculptural works, offered a more self-contained and introverted response to the exhibition spaces. Using many different colors of chalk, Rawls drew on the wood floors, while at the same time rolling around slowly on the floor, gymnastically at times, as he coated himself with more and more layers of colored chalk dust. This accretion and transfer of materials and gestures created a kind of call and response not only with Joo’s works, but also—by extension—with the whole exhibition. In a very different vein, Rebecca Brooks’s three-hour long, continuous dance performance, YALA, delicately engaged very different surroundings. On the wall behind her was a series of austere black and white Richard Serra prints which she responded to with her own sensual, curvilinear movements, which in turn were echoed in a more direct way by the proximity of Ray Smith’s sculptures. Both dancer and sculptures seemed to roll and undulate throughout the space, which was in a sense “framed” by Serra’s rectilinear forms. 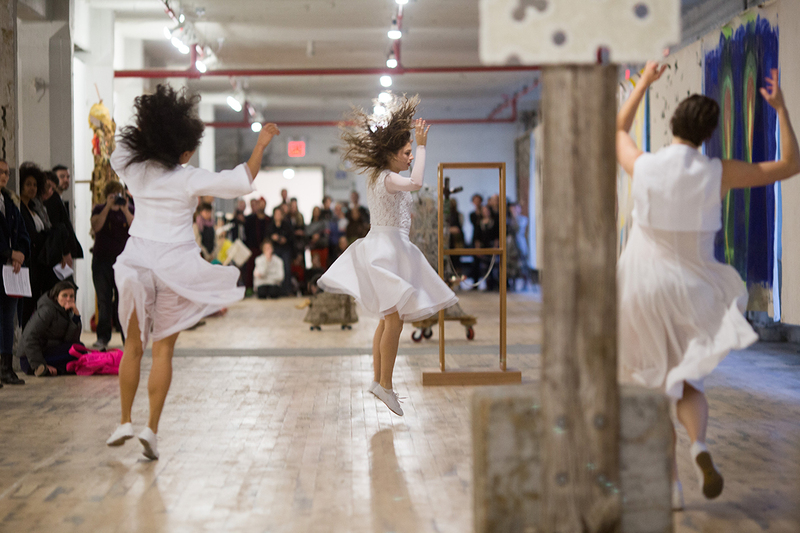 Here, as elsewhere in the performances, movement was infused into the still spaces between the stationary artworks in such a way that both the dancers and the artworks came to be seen differently. The interplay between them became a kind of physical manifestation of the kind of artistic dialogue that underlay the conception of the exhibition itself. “YALA” by Rebecca Brooks in “Perfoming the Precarious: Day into Night,” presented by Danspace Projects. December 7, 2013. Photo by Ted Roeder. Vast as they were, the exhibition spaces also allowed for warmth and intimacy—both for the works and for the performers. Xaviera Simmons’s performance of Yoko Ono’s riveting Cut Piece, the first part of Performing the Precarious, was an especially memorable example of what could be done with this kind of intimacy. Simmons had performed the piece before, but in larger, more traditional, stage-like settings. For Come Together she chose simply to sit on the floor in front of a windowed wall, on the same plane as the audience, dressed in a flowing brown dress. She and performance curator Lydia Bell of Danspace had selected Cut Piece as a response to the “devastation of Sandy and the vulnerability of humans and cities everywhere.” In this performance, members of the audience come forward at their own pace—often slowly, but sometimes decisively—and cut off pieces of the performer’s clothing. The austere and yet emotional way in which Simmons performed this piece made vividly tangible the deep intimacy that vulnerability can create between people. It explored something deeper as well: how human beings can make themselves less vulnerable by banding together, especially in moments of great stress or tragedy. Come Together created a platform in which artists could learn from the tragedy and also grow more resilient. Many artists found themselves either devastated or in extremely vulnerable situations in the aftermath of Sandy, which ruined studios, materials, and years worth of stored work. In the days immediately following the storm, a number of conservators came together to help artists salvage what they could. But the question remained, even a year later, of what preparations might have mitigated the losses suffered by artists. Many of those same conservators teamed up with the Craft Emergency Relief Fund (CERF+) to generate materials outlining how to prepare and protect a studio before a disaster strikes. CERF+ hosted a panel discussion on these matters in the Come Together galleries, highlighting the need to invest in thoughtful studio design, proper emergency procedures, adequate insurance, and relationships with conservators, which could provide artists with the means for navigating their way through catastrophic situations. Although some might find it hard to address such issues after the fact, Come Together created a platform in which artists could learn from the tragedy and also grow more resilient. The International Network for the Conservation of Contemporary Art-North America (INCCA-NA) took on the difficult task of asking artists to speak openly and candidly about their losses and about how their vulnerability may have changed (or not changed) their studio practice. Beginning on the opening night of the exhibition, and continuing every Saturday for the next two months, conservators affiliated with INCCA-NA conducted oral history interviews with artists who had been directly affected by Sandy. Even a full year later, some artists had not yet fully recovered, and at times bursts of raw emotion—even sobs—broke through the veneer of the interview format. It was instructive to see how varied the responses were. Some artists lingered on past losses. Others had chosen to push forward and not look back. The wide range of emotional responses in these oral history interviews reflected the different ways in which various artists were able to explore the complex new realities that they had to face in their studio practices. The conservators, some independent and some from major institutions such as the Brooklyn Museum of Art and the Hirshhorn Museum and Sculpture Garden, subtly and sensitively inquired as to how the artists had dealt with the trauma of lost and damaged work. The hope was that by working together, artists could be better prepared, and conservators better equipped, to help artists deal with the next disaster. The best way to move forward and recover, they realized, was to learn from each other and to expand the support network, individual by individual. Anne Waldman reading in “Oh! Sandy: A Remembrance.” November 10, 2013. Photo by Zack Garlitos. the misplaced funds, the allocated ruins, prophetic ignorance. then what. clothing. panicked mother. dead lines. then dead lines. dead lines. and some lives, dead. if and then the art you make the poetry you stir up, could it be “gone” “lost” never return? The theme of disaster as generative force was explored further in the panel Beyond Backdrop: Fiction in the Wake of History, where authors Joseph O’Neill, Lucy Alibar, and Alex Gilvarry discussed how they incorporated traumatic events into their fictionalized narratives. The organizers of the panel, co-editors of the Rail’s Books section, Katie Rolnick and Joseph Salvatore, chose the writers because their “work and process could provide context for the fictional stories that would inevitably arise in Sandy’s wake.” Each of the authors described how fact could play an important role in fiction, by adding depth and nuance through context, and by challenging readers to reassess their own personal experiences in relation to specific traumas. “Battle of the Artists’ Bands.” November 24, 2013. Each of the events that were mounted during the course of the exhibition explored ways in which it might be possible to move beyond the uncertainties of living a creative life in a city like New York, where the unpredictable is constantly occurring, and where coping with the constantly changing physical, economic, and human landscapes is both a challenge and a source of inspiration to artists. Hurricane Sandy taught us that there is no one way to overcome disaster or even to prepare for it. But there are nonetheless many ways to learn from all sorts of disasters, large and small. Over the course of the exhibition and all of its related events Come Together made it clear that community and dialogue lie at the heart of both surviving and thriving, and that, in the end, the sense of community is one of the most valuable assets that anyone in any city has to depend on. Beauty may emerge from catastrophe, and inspiration from trauma, but the strength to overcome and move forward emanates from coming together, as we prepare to face whatever may befall us in the future. Readings by poets commissioned to write about their experiences during Hurricane Sandy. Published as a chapbook by the Brooklyn Rail in 2014. Poets: Charles Bernstein, Anselm Berrigan, LaTasha N. Nevada Diggs, Tonya Foster, Nada Gordon, Bob Holman, Erica Hunt, Paolo Javier, Pierre Joris, Vincent Katz, Erica Kaufman, Rachel Levitsky, Tan Lin, Tracie D. Morris, Anna Moschovakis, Bob Perelman, Anne Waldman, Elizabeth Willis, Matvei Yankelevich.